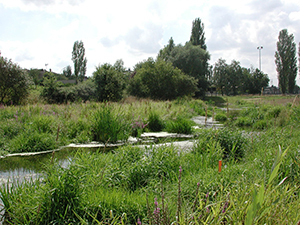 50 years ago the allu­vial land­scape between Ober­an­ven and Nieder­an­ven was marked by near­ly untouched brook sides. The very low incline of the site pro­voked that the local brooks (Staflick and Bouneschbach) began to mean­der and con­stant­ly over­flew at flood­ing time. 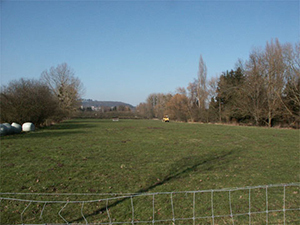 The flood waters slow­ly changed this site into an extend­ed wet­land. The soil, rich in clay, favourites the water stag­na­tion trans­form­ing the pas­tures into wet grass­lands which since ever had been very use­ful in agri­cul­ture. 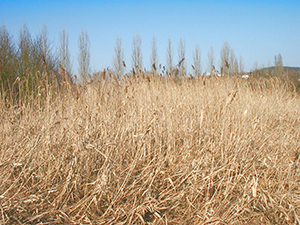 The typ­i­cal wet­land veg­e­ta­tion with the typ­i­cal canary grass­es like the reed plant, the reed-canary grass or the Typhaceae grass was sign­ing this flood­plain. 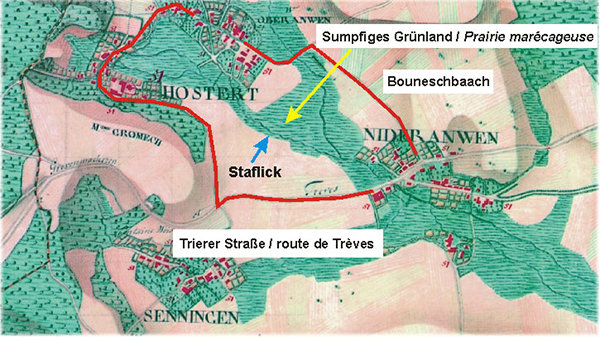 On the famous Fer­raris map, you can see that there was no direct link between Ober­an­ven and Nieder­an­ven. Because of the swampy char­ac­ter of the ground, only one road, cross­ing the vil­lage of Hostert and one path over the Bouneschbach brook was con­nect­ing the two vil­lages. Remain­ders of the typ­i­cal allu­vial veg­e­ta­tion of once at the edge of the Staflick brook. In order to gain more agri­cul­tur­al land, the brooks had been canal­ized and the wet­land dried up by set­ting drainage lines. Lat­er on, the dried zone had been trans­formed into a social site, where the school cen­tre “Am Sand”, the res­i­den­tial homes for elder­ly “Cipa” and the cen­tre for cul­ture and leisure “Loisi” had been built. By this same oppor­tu­ni­ty a new road, link­ing Nieder­an­ven with Ober­an­ven, bor­dered with dif­fer­ent oth­er con­struc­tions had been con­struct­ed. If you have a look on the old maps and com­pare them with the sit­u­a­tion of today, you can observe that the brooks had not only been straight­ened, but that they com­plete­ly changed their course in the way that the con­flu­ence of the Staflick and the Bouneschbach had been trans­ferred to the route de Trèves. Actu­al agri­cul­tur­al use of the zone between the two brooks in form of pas­tures. 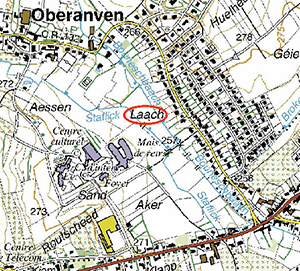 The place called “Laach”, a word appear­ing in many local names in Lux­em­bourg, means “swamp” and is used here for the road, con­nect­ing Ober­an­ven with Nieder­an­ven, recall­ing by its name the for­mer char­ac­ter of the land­scape.